Because sometimes you have no control over life and it keeps you far away from who you love. You are always working on your worst book and your best book at the same time. The praise does not make you write better, and it shouldn’t make you write worse, either. When we’re upset, our vocal cords tighten and we can’t speak. And when I lie – well, I can’t lie, because the same thing happens – everyone who knows me knows that when I start squeaking, I’ve started lying. The trouble with calling a book a novel, well, it’s not like I’m writing the same book all the time, but there is a continuity of my interests, so when I start writing a book, if I call it ‘a novel,’ it separates it from other books. I wish I could avoid the people who have threatened me. My favorite threat is that I will be thrown in the River Miljacka, which is at most knee-deep, with my feet bound in cement. I really don’t feel that any of the pieces I wrote were confessions; there are no revelations about secrets in my life, and actually I have nothing to confess and I certainly do not ask for redemption and there is no reward for confessing that I expect. I read everything I could find in English – Twain, Henry James, Hemingway, really everything. And then after a while I started writing shorter pieces in English, and one of them got published in a literary magazine and that’s how it got started. After that, graduate school didn’t seem very important. I don’t make notes for myself because I either lose them or they make no sense to me at all. I once found a piece of paper with the note: ‘everything.’ Apparently I made a note to myself not to forget everything! I do have a sense of displacement as constant instability – the uninterrupted existence of everything that I love and care about is not guaranteed at all. I wait for catastrophes. I did not intend to stay; I had no experience in the United States – I may have been here less than 24 hours – but I knew I would never get inside there. And ‘there’ not being America necessarily, but that harmonious mode of living that some people are lucky enough to have in this country. I actually didn’t listen to the Beatles song ‘Nowhere Man’ when I was writing my book of the same name. What I listened to a lot was ‘Abbey Road.’ Its disjointedness and its readiness to confuse only to delight were inspiring to me. A particular piece of music attaches itself to the piece I’m writing, and there is nothing else I can listen to. Every day I return to the same space to write, the music providing both the walls and the pictures on the walls. When I came to America, I was already a writer, already published in Bosnia. I was planning to go back, but I had no choice but to stay here after the civil war, so I enrolled at Northwestern in a master’s program and studied American literature. I suppose I’m interested in sorrow, which is very different from depression or despair. Sorrow is continuous with the world; it allows for creativity. When I found myself in the U.S., and the war was at full swing in Bosnia, I read for survival – it was a means of thought resuscitation. To me there’s no difference between a book of stories and a novel – they’re just slightly different shapes. Our daughter was born in Chicago, and she’s already showing it. The temperature has to be approaching zero for her to wear a hat. New York is the Hollywood of the publishing industry, complete with stars, starlets, suicidal publishers/producers, intrigues, and a lot of money. 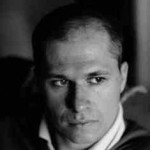 Aleksandar Hemon is a Bosnian American fiction writer, essayist, and critic. He has written five books: The Book of My Lives; Love and Obstacles: Stories; The Lazarus Project: A Novel, which was a finalist for the National Book Award and the National Book Critics Circle Awards, and was named as a New York Times Notable Book and New York magazine's No. 1 Book of the Year; Nowhere Man, also a finalist for the National Book Critics Circle Award; and The Question of Bruno: Stories.